On Sunday, May,15, if the weather is nice, I organize a hike to the Pointe d’Areu (Arbennes) 2478 m.
We start from Romme Sur Cluses. Via the ridges and the summits (Sallaz, Muets, Château …) we arrive to Principal summit. During all our way we have a great view over the neighboring summits and the valleys. 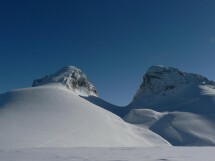 The summit is a part of the great peaks of the northern Aravis. Elevation gain: about 1200 m. Distance about: 16 km. For experimented and sporty hikers. If the snow condition or the team does not Ok, we will stay at the Tête du Château. Probably we will not need snowshoe. But the gaiters are necessary. Because there are much of snow at this area. This hike will be done only if the weather is nice. The participants will receive an email on Saturday afternoon. Equipment: Good shoes, gaiters, hat, gloves, warm and waterproof clothes, sticks, picnic, drink. All participants must be well-prepared and have all equipment with themthem.